Are the Trail Blazers finally passing through a season-long run of inconsistency and some rough patches? Are was that simply a mirage known as the Atlanta Hawks on Friday at Moda Center? The Blazers, guardedly at least semi-positive, think the answers might be, in order, yes and no. Evidence for a yes was the way they played team ball, used their bench and got leadership from a less-than-100 percent Damian Lillard on Friday. The result — a 110-89 victory that avenged a 104-89 Dec. 30 loss at Atlanta — wasn't pretty much of the night. But the third quarter was an exception, and it propelled the Blazers to the easy win and a season-high 30 assists. "It was good to see. It's nice to have one of these at home. … We're playing better," coach Terry Stotts said. A better test will come on Sunday, when San Antonio shows up for a 6 p.m. And then it's back on the road for important NBA Western Conference meetings with Oklahoma City on Tuesday, Houston on Wednesday, New Orleans on Friday, Jan. 12, and Minnesota on Sunday, Jan. 14. The Blazers are noted for playing the Spurs tough, especially at Moda Center. "But momentum can come and go," said Stotts, who was equal parts cautious and optimistic after his team (20-18) won at home for the second game in a row and got to 9-10 at Moda this season. The Blazers led only 52-46 at the half, but used a 20-6 run in a span of under five minutes to go in front by 17 points midway through the third quarter. The Hawks never were a threat after that. In the third quarter, Portland had 10 assists (four by Lillard) on 12 baskets (four by Al-Farouq Aminu, who missed one shot in the period). The Blazers shot 54.5 percent in the quarter, had nine of their 16 fast-break points and outscored the Hawks 30-22. The burst allowed Stotts to rest his starters almost the entire fourth quarter; Lillard, who was nursing a tender calf, didn't play after the third quarter. "I was really pleased with the second half," Stotts said. "The first half was solid, but our focus and energy in the third quarter was really good. We got hands on a lot of balls and got out in transition." The difference, in good measure, was Portland's ball movement. "The last three games our passing has been improved. We've just got to continue that. 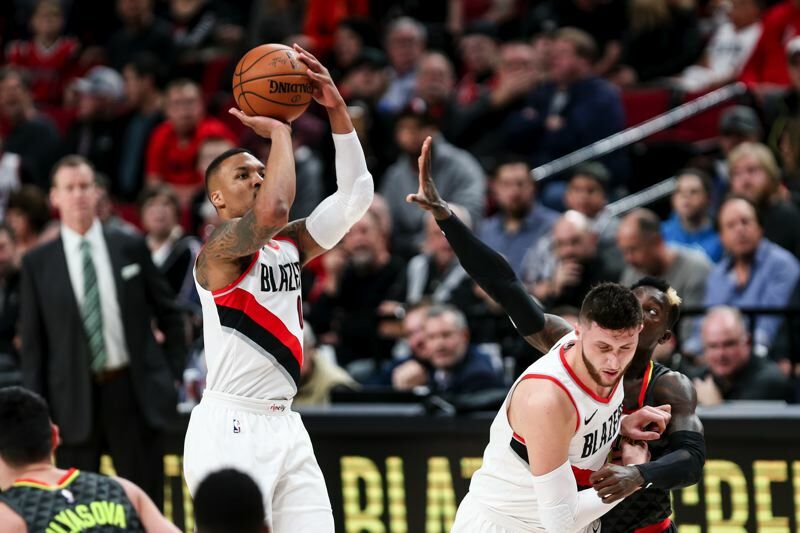 Our passing has been below average most of the season," Stotts said, adding he felt Portland's 11 first-half turnovers enabled Atlanta to generate the offense it needed to make it an almost even game through the first two quarters. Why have the Blazers been passing better of late? "Hard to say," Stotts said. "Tonight it was maybe making the extra pass. I don't think it's necessarily that we're more in tune … I don't want to overanalyze it. Let's be happy." "I just thought we lightened up," Portland's veteran point guard said. "To start the third quarter, we came out right. We got our hands on balls, we contested shots, we continued to get to spots and share the ball offensively, and we were able to sustain that." The opposite happened at Atlanta, with the Hawks winning the second half in a big way and recording the upset that night. Lillard finished with 14 points, and backcourt mate CJ McCollum had a team-high 20 points. All five Portland starters reached double figures in scoring well before the end of the third quarter. Center Jusuf Nurkic ended the night with 11 points and nine rebounds. Small forward Evan Turner wound up with 10 points, going 4 of 5 from the floor. Power forward Aminu had 14 points, 11 in the pivotal third quarter. The Portland bench made a difference, too. Stotts used four reserves primarily in a nine-man rotation, and the combo of guards Shabazz Napier and Pat Connaughton, forward Ed Davis and inside rookie Zach Collins combined to make 15 of 21 field-goal attempts and score 36 points, with Napier getting six assists to matching Lillard and McCollum. Davis was a pest around the hoop as he finished five of six field-goal attempts and grabbed five rebounds to lead the reserves in scoring with 12 points, all in 18 minutes. unorthodox, but it's very effective." Davis said the Blazers had the loss at Atlanta on their minds before the game. "We knew we had a bad loss. We wanted to get home and play in front of the home crowd," he said. On his play and role, "you pride yourself with being the cleanup guy on this crew," he said. And, of the team overall, "the team ball movement was superb." The nine-man rotation was indeed clicking, and might be the way of the immediate future. Or not. "It was kind of that way before 'Dame' got hurt," Stotts reminded reporters, not wanting to commit to it long-term, though, because "I never like saying I've settled in on something." Atlanta, which has the worst record in the NBA at 10-28, couldn't sustain enough offense this time to stay with Portland. The Hawks shot as if blindfolded at times and made 36.1 percent from the field. Dennis Schroder led them in scoring with 14 points. "Obviously in the second half Portland played really well and we just weren't good enough on either end to match their execution offensively, their aggressiveness defensively," Atlanta coach Mike Budenholzer said. "A lot of credit to Portland." "Take the mistakes and learn from them," Hawks guard Taurean Prince said. Rookie Tyler Dorsey, from the University of Oregon, had eight points in 11 minutes off the bench for the Hawks, making 2 of 6 shots, including his only 3-point try. "Tyler Dorsey was good in his minutes, got some good looks moved well," Budenholzer said. Portland, which had lost three in a row at home to Atlanta, remained seventh in the NBA West. The Blazers trail No. 5 Oklahoma City (22-17) by 1 1/2 games and No. 6 Denver (21-17) by one game. Eighth-place New Orleans (19-18) is a half-game back of Portland. The Los Angeles Clippers are ninth at 17-20, two games behind New Orleans.